A welcoming front door design is a prerequisite to every stylish home. It assures the guests about the genial ambience that is waiting for them beyond the door. A shabby doorway hardly ever leads into a warm and welcoming home. Feng shui suggests designing a beautiful and uncluttered doorway for your residence. It helps circulate positive energy in the interiors. 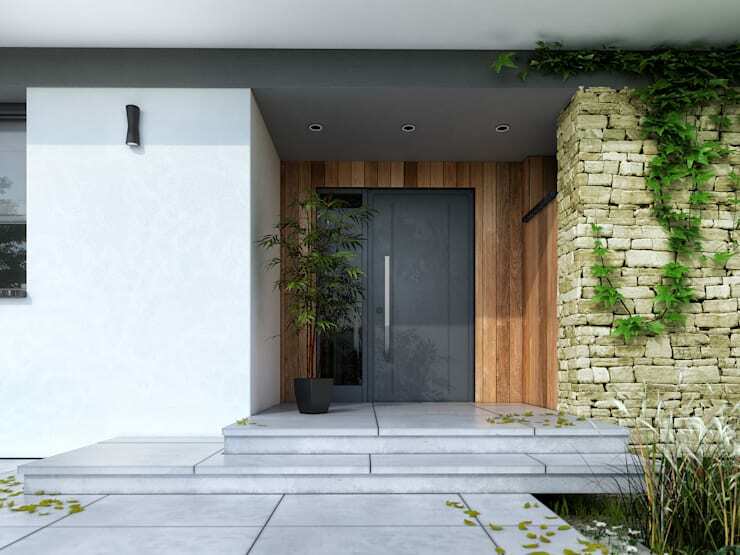 So what are some of the ingenuous front door designs that you may opt for in your home? Let’s find out. Pink is not the colour that easily comes into mind while planning the front door design. But see how the owners of this home used pink to vivify the front façade of their home. They have balanced the hot pink tone with pitch black border. Clear glass windows show a glimpse of the interior. Green plants border the pathway and a kid’s cycle hang from the wall next to the glass window. The design of this front door looks stunning due to the presence of the framed picture window on the side. The façade shows an unusual interplay of textures. While smooth satin finishes decorate the door and window frames, the wall itself is stylised with a rather rough texture. Trees and shrubs, planted on the wayside, greet every visitor who come to knock on the door. 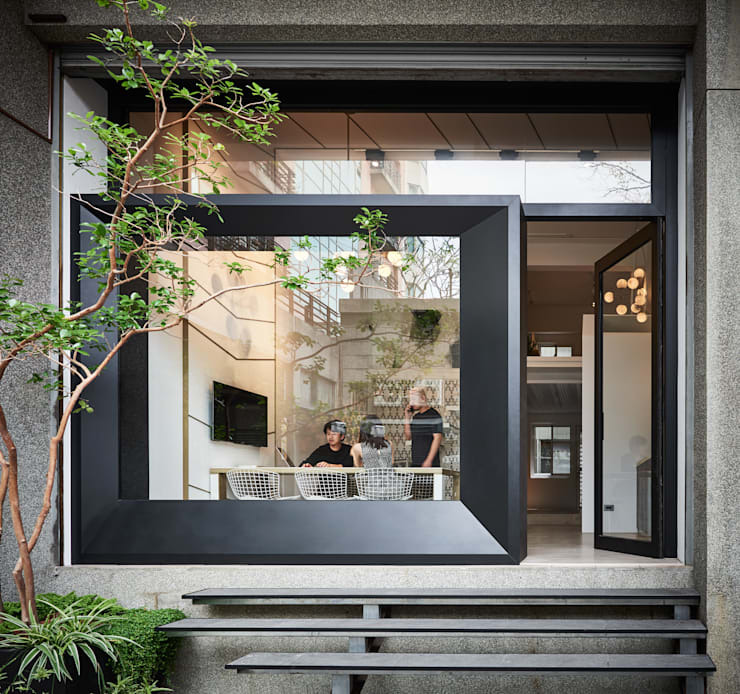 Sliding doors are favoured for multiple reasons. They don’t take up additional space when opened. Sliding glass doors can help you gain a panoramic view of the surroundings. See how the architect of this family residence added an extra dimension in the form of a wooden deck. It is further decorated with potted plants and skylight installations. Once again we see an imaginative use of colours on the front door. 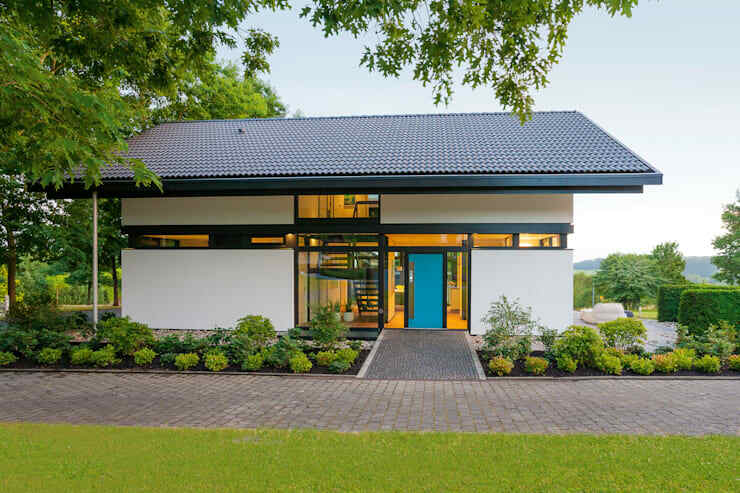 The black and white façade of this modern cottage gets a refreshing touch in the form of this blue door. A short walkway, made of stones, give access to the main door. The surrounding greenery beautifies the structure even more. Door designs cannot be simpler than that. The dark grey tone suits the colour of the façade perfectly. It is designed with narrow picture window on one side. A small rock garden precedes the tiny porch. The prominent front door of this residential building lies in the middle of the two wings of the house. The asymmetrical design of the wings gives it an unusual look. The door acts as the meeting point between the two sections of the building. What’s more? It is painted in a ravishing red colour. 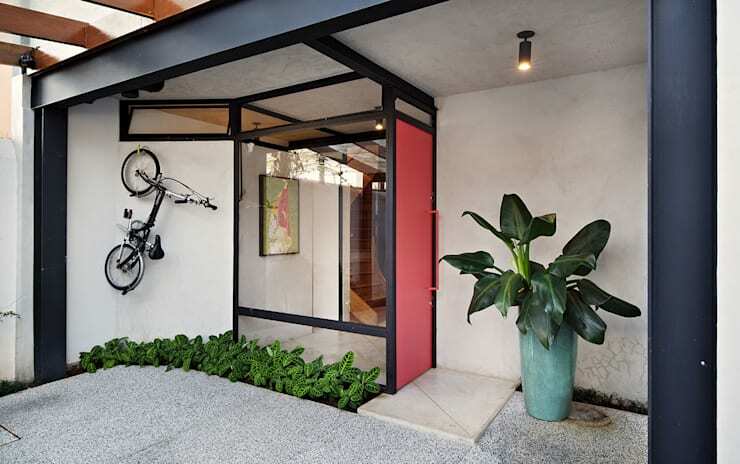 The main door of this house is preceded by a skilfully decorated small patio. It is designed with simple flooring made of concrete tiles and exposed brick wall. 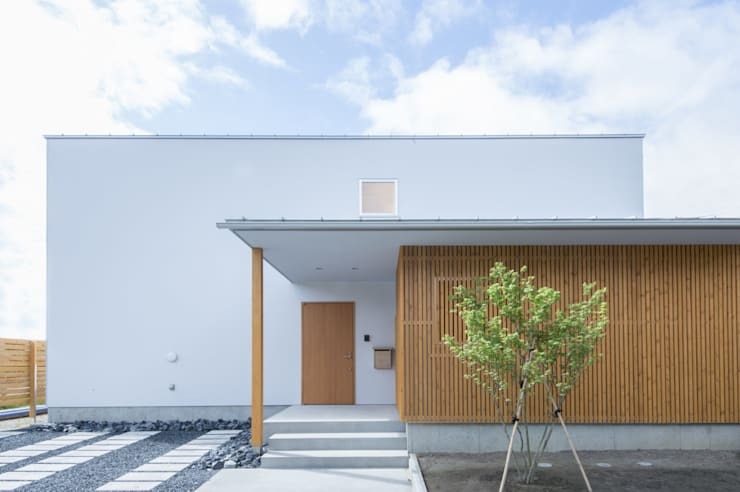 The interior designer of this home also placed a wooden bench against one of the walls. You may access the living room directly from the patio or press the doorbell by the side of the front door. 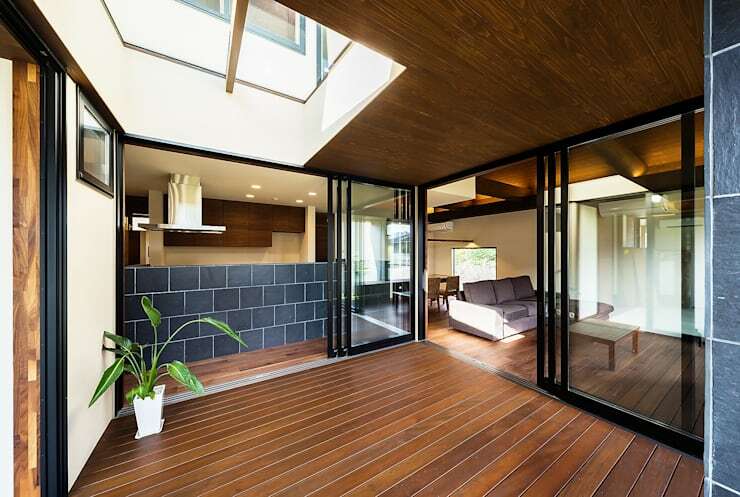 The door itself is made of horizontal wooden slats and followed by a secondary glass door. Beauty lies in simplicity. 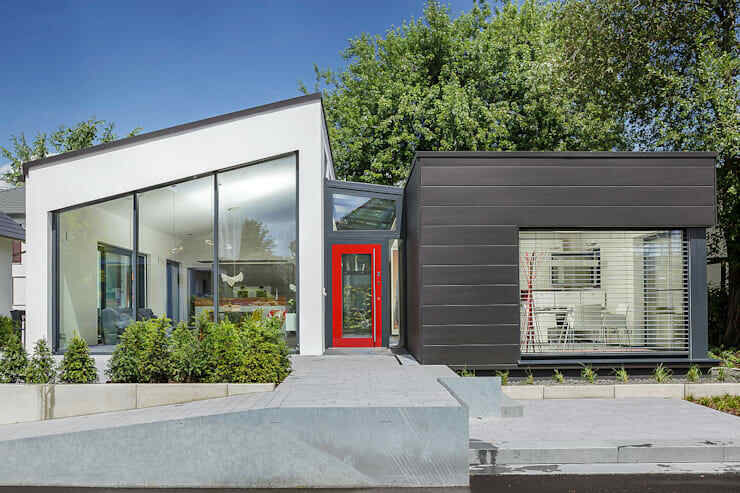 The façade of this single family home proves it once again. Its box like structure is steeped in a sparkling white tone. 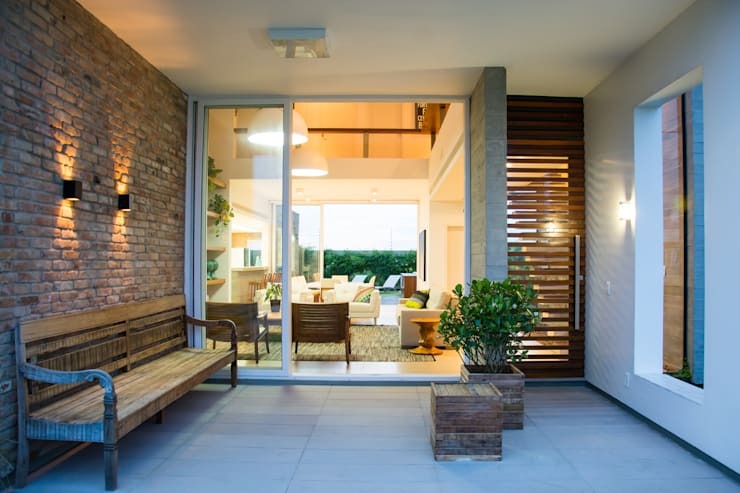 Wooden front door, along with wood clad patio wall, gives it a very graceful makeover. A small rock garden induces a tranquil charm. Flush doors are preferred for their simple and smooth design. They seem to match the façades of the contemporary buildings. 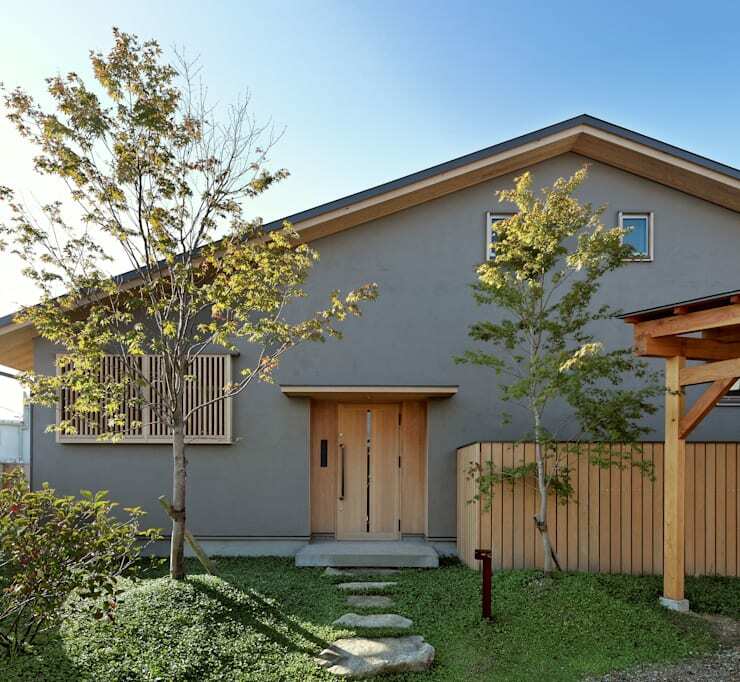 The owners of this home have complemented the dark tone of their front door with wood clad side walls. Focus lighting fixtures illuminate the small porch and wall sconces brighten up the stairway. Potted plants and vines greet make the entryway look even more cheerful. Check out these simple to implement tips to enhance the beauty of the entryway. Do you intend to build a classical style residence any time soon or redesign an existing one? Then take a note of the simple but elegant design of this spacious front door. 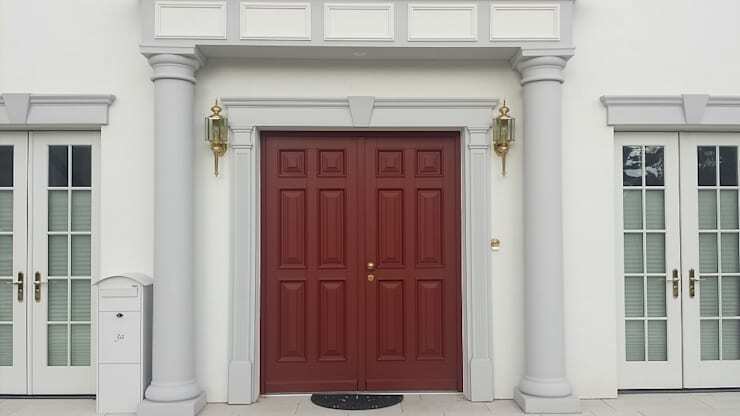 The panel door is steeped into a cherry red hue. It immediately gives out a welcoming feel which is the hallmark of any successful design. When it comes to choosing the right material for the front door, wood is considered a perennial favourite. It helps you design a stylish and warm entryway. Wood is sturdy and, when taken care of properly, may last for generations. Quality timber is not prone to the attacks of consistent rain or harsh sunshine. The main door of this residence is imbued with the flavour of the Mediterranean. It is spacious, coloured in green and accompanied by a secondary wrought iron gate. 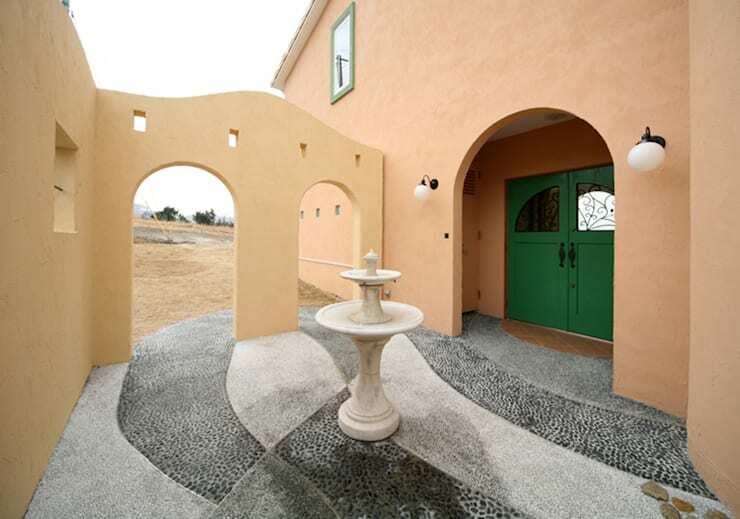 The entryway decorated with pebble stone flooring, a small fountain and arched gates make it look simply gorgeous. 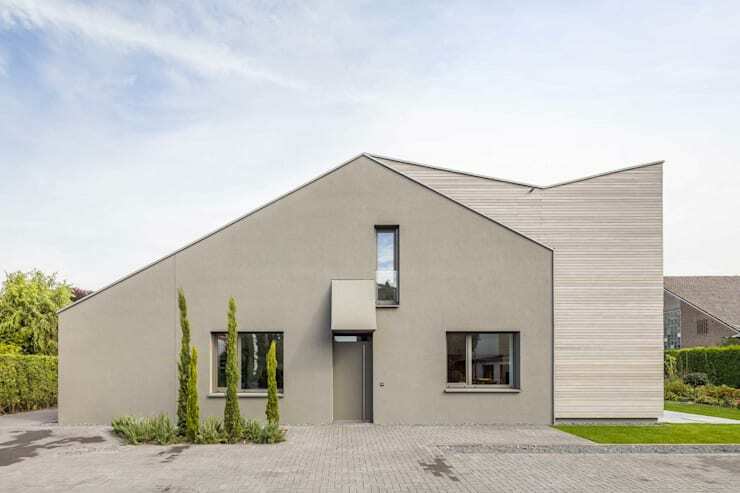 The grey front door of this house seamlessly matches the colour of the façade. Its simple design makes it look in tune with the surrounding atmosphere. A few green plants, placed close to the façade, make the entrance look elegant and welcoming. 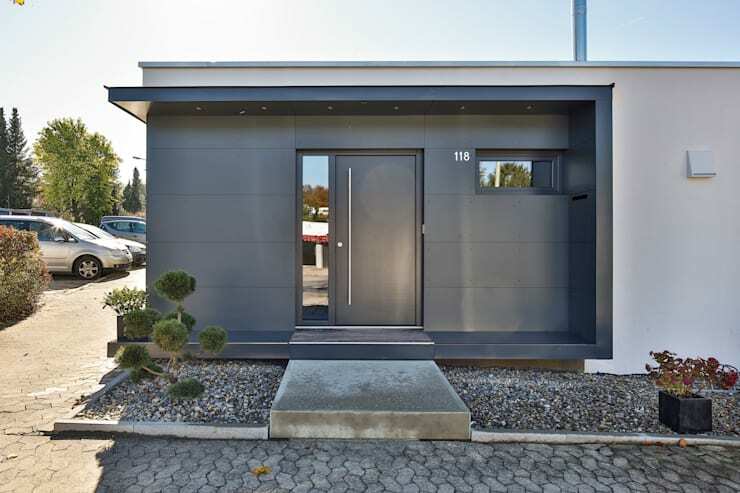 Don't miss out on these smart ideas for spectacular facade designs. Which of these front door designs did you find most attractive?